OK, I’m going to level with you all: I try not to base my weekly spotlight on what comic book movies are coming out this week. Usually I try and keep my reviews to books I think you should read on their own merits … but some weeks I indulge myself, and this is one of those weeks. With a rebooted “Hellboy” movie coming out the day this article is published, I want to dedicate this week to the “Hellboy Omnibus Vol. 1: Seed of Destruction,” written by Mike Mignola and John Byrne. 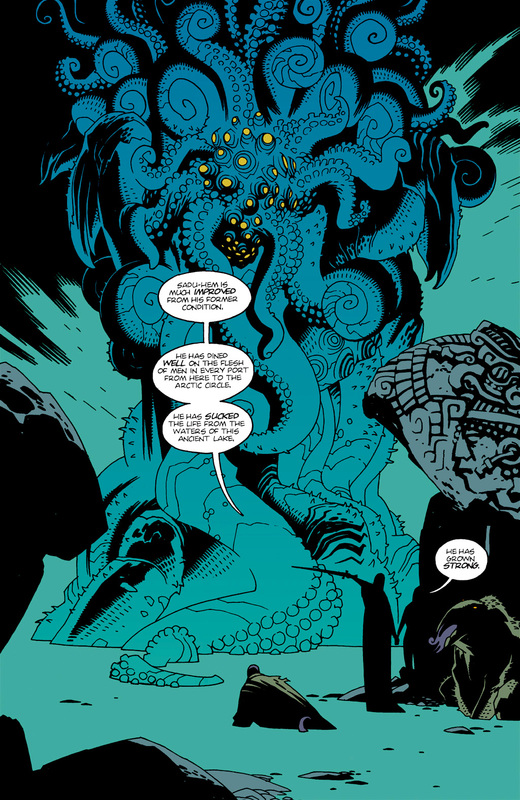 For the uninitiated, Hellboy is a supernatural detective with a knack for averting apocalyptic catastrophes, like the time Rasputin (yes, that Rasputin) tried to summon a giant, tentacled beast to end the world. 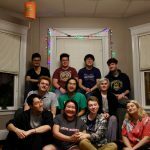 Oh, and our protagonist looks like a demon, complete with red skin, hooves, a tail and a pair of shaved horns that sit like goggles on his forehead. The first volume lives up to that insane premise with gusto, tracking some of Hellboy’s first adventures in the early 1990s. 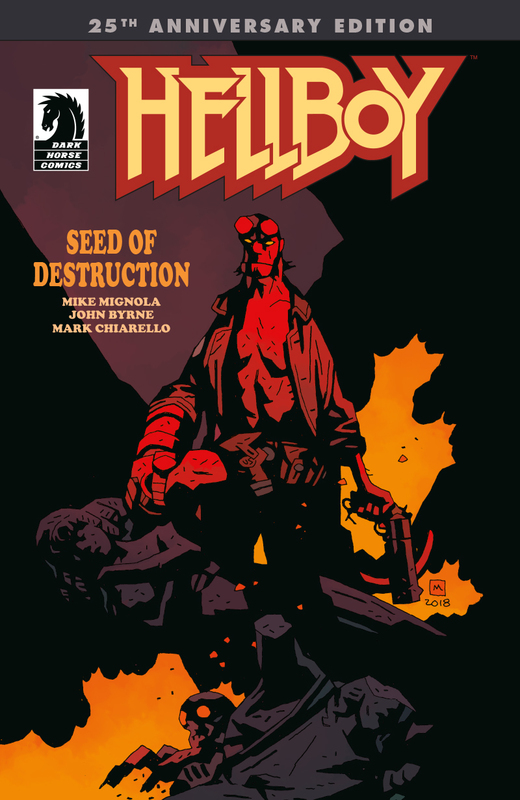 This being the first volume of a greater series, it also serves an ideal jumping on point, with the reader witnessing Hellboy’s arrival on Earth within just a few pages. 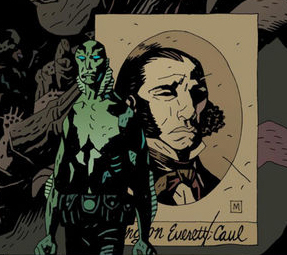 After that, the book moves at a merciless pace, putting the reader through an adventure that introduces them to the Bureau for Paranormal Research and Defense, as well as Hellboy’s friends, Abe Sapien (a fish-human hybrid) and Liz Sherman (a woman with the ability to control fire). 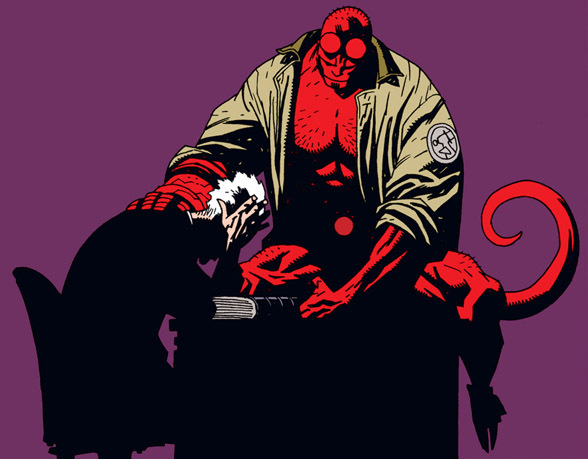 The first story, from which the omnibus takes the name “Seed of Destruction” also reveals the greatest threat in the Hellboy universe: The Ogdru Jahad, an ancient threat that would bring about the end of the world as we know it. As Mignola wears the hats of both writer and artist on the title, I feel obligated to say that his art is something else. No description of Mignola’s art would be complete without talking about his use of darkness to create the illusion of depth. 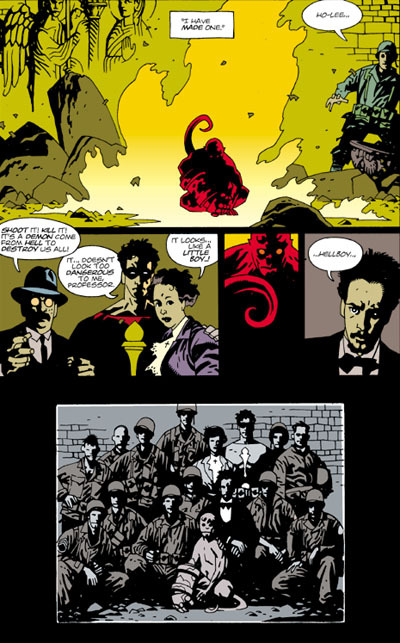 Mignola’s pencil work and coloring paint objects in the foreground in color, but any object beyond what is directly in the panel’s center is usually shrouded in varying degrees of darkness. The effect is wholly unique, and it really plays up the horror roots of the book, making locations like a desolated church or an old mansion slowly sinking into a lake feel appropriately spine-tingling. The resulting images look like something straight off an old “Iron Maiden” album cover, certainly not your typical comic book fare. For any of you out there looking for something a little different than a typical superhero comic, but still craving some good action, I can’t recommend the first volume of “Hellboy Omnibus” nearly enough. Never diving fully into horror, while also never becoming too light or upbeat, the first volume sets up a saga that wouldn’t see its completion until 2016, and the foundations of the grand mythos of Hellboy are all here in volume one.